Ahhh, it won’t be long and the snow will be falling, Christmas music will be playing from our radios and the smell of fresh pine will fill the air. I absolutely love everything about Christmas! 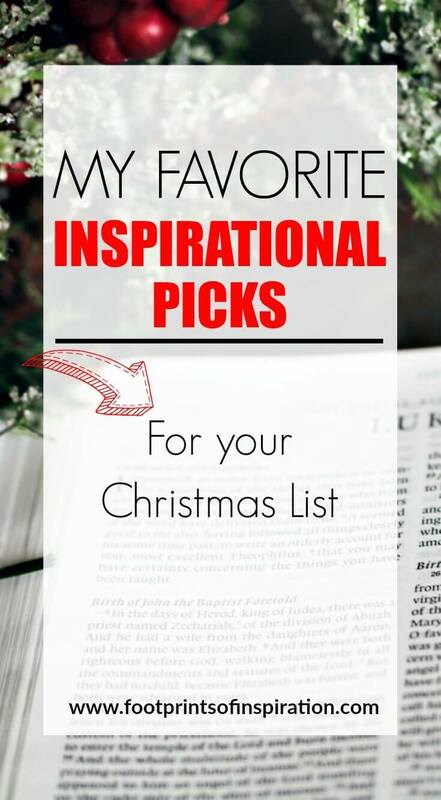 And since it’ll be here before you know it, I’ve put together a list of my favorite inspirational picks for that special someone on your Christmas list this year. Yep! I’m a Christmas geek through and through. I love all things Christmas! Spending time with my family, the shopping and music, wrapping our gifts in the beautiful paper and gorgeous ribbon… it makes my heart so incredibly happy just thinking about it. It won’t be long and my husband and I will sit down to plan out our gift giving for this year, so I thought it was time to put together my annual list of favorite inspirational gifts for you. Perhaps you’ll find something that will make the perfect gift for that special someone on your list, or you may even want to add it to your own wish list this year! If you have a book lover on your list, you won’t go wrong with any of these. Some are old-time favorites of mine and others I’ve read this year. You can find most of them at your local bookstore, or by clicking here. The Magnolia Story: With Chip and Joanna Gaines taking over the world one home at a time, they have inspired us all with their talent, creativity and, most of all, their deep family values. They offer a wonderful insight into how they got started and how they’ve relied on God to help them through some of the most difficult times in their life! Tattoos on the Heart: I must say that I think this is my favorite read of the year! Written by Gregory Boyle, a pastor who founded Homeboy Industries (a gang-intervention program located in the Boyle Heights neighborhood of Los Angeles, aka the gang capital of the world.). He shares his journey of unconditional love and, just like Jesus, meets these kids right in the middle of their life – right where they need him most. Truly an unbelievable book. Alert: This book does have a lot of strong language. If You Only Knew: Another great book that I read this year. Jamie Ivey shares her raw and honest story about how she found the unconditional love of Jesus. A great, great read! The Dream Giver: A must-read for everyone! We were all created for a specific purpose and Bruce Wilkinson shows how to stop living in your comfort zone and go out and live the life you were created for. A definite must-read for every Christian! Since I began starting my days with a devotional and prayer journal, my relationship with God has completely changed (if you haven’t already, be sure to check out How to Start a Prayer Journal), and I highly recommend this for everyone! 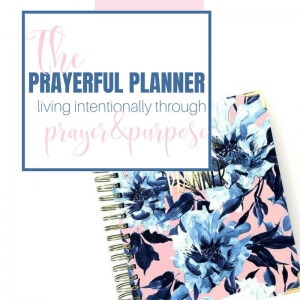 Below you’ll find some of my favorite Bibles, devotionals, and prayer journals. Unless otherwise noted, you can find them all by clicking here. Pair one of these with a nice journal and pen, or perhaps a fun coffee cup with a gift card to their favorite coffee shop. How fun would it be to open that on Christmas morning? Finding Peace in the Mess by yours truly. There’s not a single person on this earth that has not experienced some sort of pain and heartache, but it is possible to have both peace and pain at the very same time. 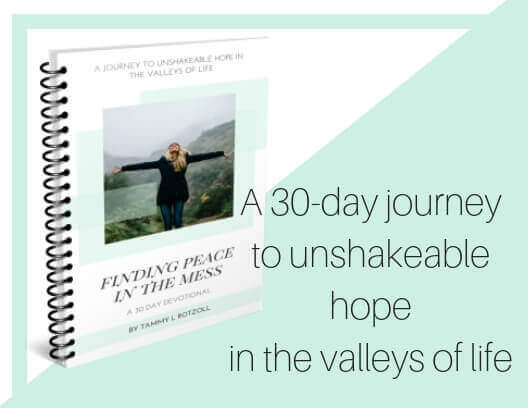 This 30-day devotional takes you on a journey to unshakeable hope in the valleys of life. (This devotional is an instant download. Print it off and take it to your favorite office store to have bound for around $5!) Get your copy by clicking here. Jesus Calling or Jesus Always: I’m a huge fan of Sarah Young’s devotionals. These two devotionals are where I started really getting to know Jesus and are great for every Christian on your list. Guts, Grace, and Glory, A Football Devotional: I got these for my guys a couple years ago and it’s a great one for your football lover. How about a Bible Cover? My poor bible has seen some better days, but there’s no chance I’m giving it up and I’m betting the person on your list isn’t giving up theirs either. Our Bibles have so many notes and pages highlighted that I can’t even imagine having to start over with another one. Instead, protect it with a bible cover. You can pick one up almost anywhere or find some of my favorites here. A prayer journal. Since I started a using prayer journal in my devotional time, I can honestly say it has completely changed my life. My relationship with Jesus has grown immensely and I’ve learned so much by devoting time to Him. 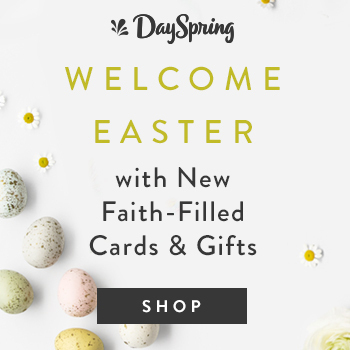 One of my favorite places to get a prayer journal is from DaySpring. They have a nice assortment of journals to choose from. While you’re there, be sure to check out all of their other gifts and cards too! Surrender Crosses by RAD JOY. I came across these gems a while back and I absolutely love them. Rick and Jackie’s journey will inspire you and the crosses will help to deepen your walk with Jesus. 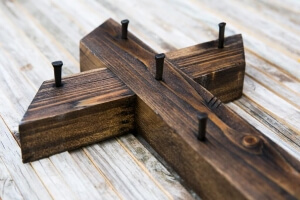 There’s something about nailing your prayers and concerns to that cross – physically giving them over to Jesus. Ahhhh, talk about freeing! 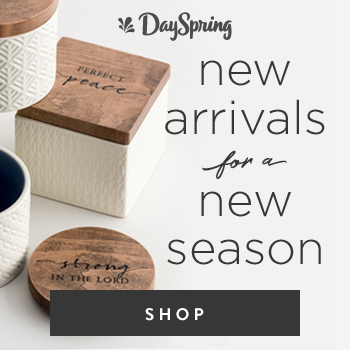 Another great resource for inspirational decor is my favorite online Christian store, DaySpring. They have so many gifts to choose from that it’s hard to….well, choose! Some of my favorites are the Round Wooden Trays with Handles. They display verses and are gorgeous! I have one myself and have used it for my Thanksgiving and Christmas decor, as well as serving when guests are over! If you haven’t heard of Elly and Grace yet, then you’re in for a real treat! 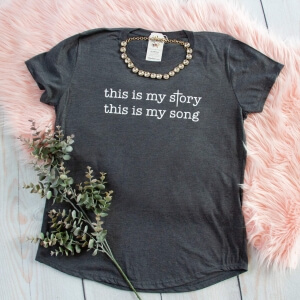 This company makes the cutest Christian clothing and it’s all so darn comfy! Truthfully, their shirts are my favorite to wear! You can hop on over and check out these adorable shirts here. I don’t know about you, but I absolutely love coming home to find a box on my front porch and when it’s from Causebox, it’s even that much more exciting. This company is all about making a difference in the world by bringing you beautiful products from companies that are giving back and making a difference in communities around the world. Do you have someone on your Christmas list that truly doesn’t need another thing? Consider giving a gift through Heifer International in their name. This is one of my absolute favorite organizations. With your donation, you will provide a family with an animal of your choice. They are educated on how to care for the animal and the animal provides the necessary food for the family as well as a way to earn more money. You know….give a man a fish, he’ll eat for a day. Teach a man to fish, and you feed him for a lifetime. So there you have it, my friend. 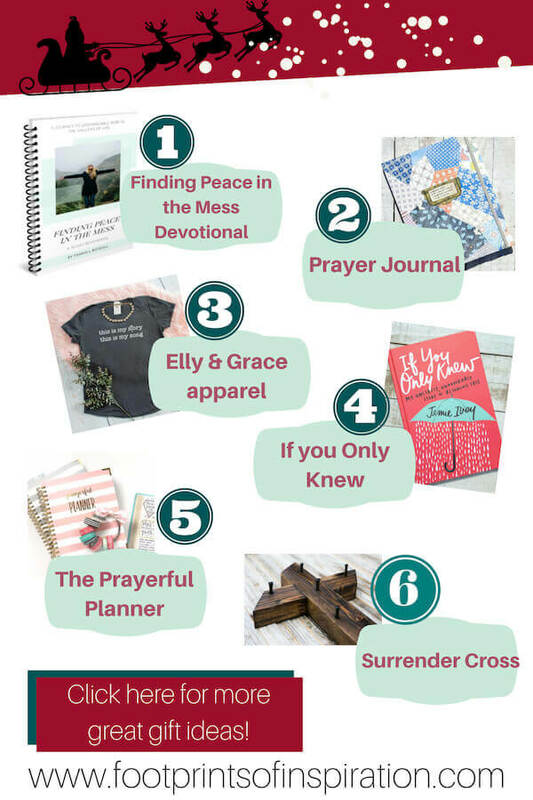 Some of my favorite Inspirational Gifts for your Christmas List! Just imagine the excitement when you give that special someone a gift of love and meaning. Something they’ll treasure for years to come. Something that will remind them of you each and every time they see it! Do you have a great inspirational gift you love to give (or receive)? Share it below. I’m always looking for another great find! Is there someone on your Christmas list that loves to craft? 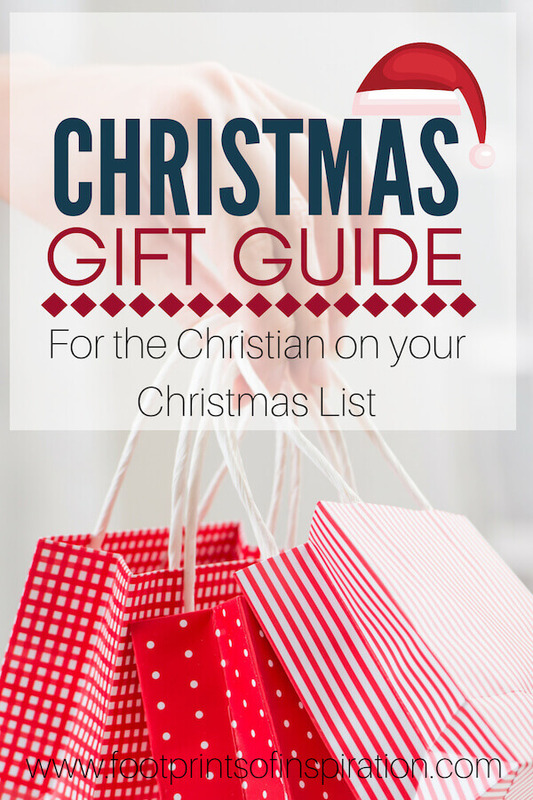 Head over to this post for my favorite Christmas picks for the crafter on your list. What a great list!! I pinned it right away and will be going back through it when I start my Christmas shopping! Thanks for the shoutout! You’re welcome, Halee! I’m glad you like it! I hope it helps with some Christmas shopping!